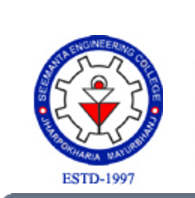 Seemanta Engineering College, Mayurvihar, Mayurbhanj was the pet project of the Seemanta Mahavidyalaya Samiti. The project was instituted in 1997 to cater to the long cherished demands of technical education of North Odisha and the bordering regions of Jharkhand and West Bengal. Seemanta Engineering College, Mayurbhanj offers various graduate courses as well as Post Graduate courses. Seemanta Engineering College, Mayurbhanj is affiliated to Biju Patnaik University of Technology, Rourkela. List of facilities available at Seemanta Engineering College, Mayurbhanj for students.